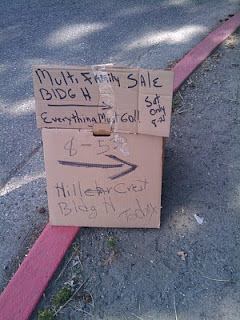 So I’m walking my dog and notice this sign for a yard sale at the Hillcrest Estates building H. I wanted to walk over and check out what they had, as I’m sure it would be some super awesome stuff. The Hillcrest Estates should really be called Hillcrest Ghettoville. They are about as far away from estates as an estate can get, so I’m sure the stuff listed by this well written cardboard sign, is choice. I’m sure the people who rent low-end apartments in South Everett at building H, must have some super fantastic items. Unfortunately I didn’t really have time to swing by and check it out, I’m sure it is my loss, as I could have picked up something super fabulous.